Granite...they called the type/pattern `Champagne`; obviously I was not at all involved. That 16 linear feet of it is the nicest thing in the whole house by far. I opened the Souveran and Purple Haze. They both smell great. Looks like the Souveran was only used once or twice! Did you use the Purple Haze? The surface of the wax looks untouched. I`d be out in the driveway waxing right now, but we hit the cold fronts of all cold fronts. It was 82 degrees yesterday. Right now it is 53 degrees and raining. I don`t ever recall an early August day being this cold. Uh, errr...It`s quite possible the Dodo was never used although I musta opened it because I noticed the lid rim was cracked a bit, hence the electrical tape around it. If I recall, I first got the small sample of the Dodo, liked it and ordered a tub...and apparently changed my mind soon after. Oops. Pinnacle was just something always raved about for the looks so I just had to see what the hubbub was all about. Mighta used that one 3 times, once on the snowplow truck at work in the middle of winter...just because. Longevity on that was probably measured in hours...but it sure looked great pushing snow at 6am under the fluorescent parking lot lights. Dark Burgundy metallic paint. This weather is just weird. Still mid 50`s, don`t think it will break 56 degrees today. I put BFWD sealant on one of our brand new fleet work vehicles on my own time, in the middle of February, because I was bored. Winter gets too long. The car only had 2,000 miles and needed to be compounded and polished. Didn`t go there. Not going to be that generous! There is so much wax left in those tins. I noticed the crack, your tape job worked like a charm. That o-ring on the Souveran seals that tub so well. I thought Hulk Hogan closed the jar. Then I resealed it using moderate torque to seal it. Tried to open again and realized the o-ring was doing its job. Noticed the spray wax was unused. I feel guilty, I will definitely pass on the generosity. Again, thank you for your generosity. 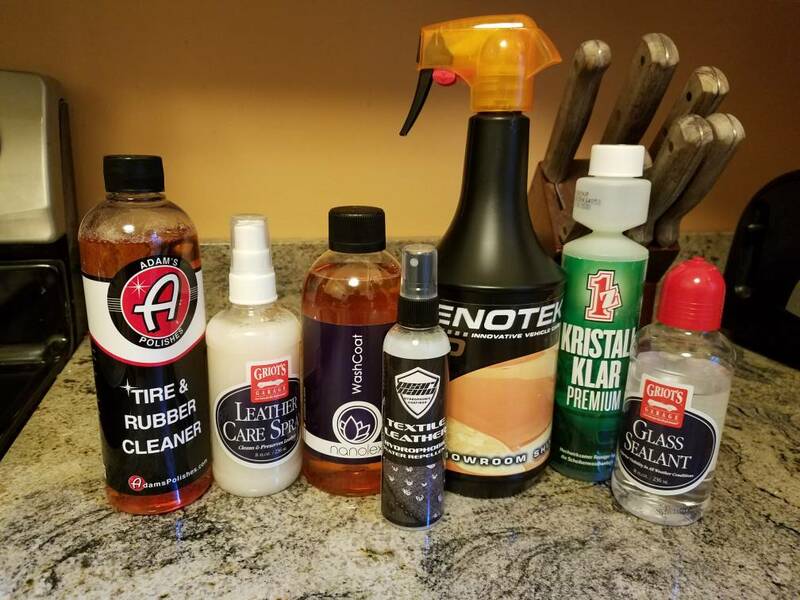 Well, obviously snatched up a Mystery Box or 2...and obviously quit doing that quick as all these items, except for the GG Glass Sealant, are unopened, never used, never will be used here so who wants `em? Free shipping to lower 48 included in the low, low sale price of $0.00! I do believe I`ve made it to the back of the cabinet. How Is the Adams tire stuff? can I get in on this? Haven`t used any if the stuff except for the GG Glass Coating which was OK. If you`d like all of it, just PM me your address and I`ll ship it out to you tomorrow N/C. Too lazy to split up so if ya want it, you`ll get all of it! The Kenotech is a really nice QD/Spray Wax if you use waxes or sealants. And the Nanolex Washcoat is like Gyeon Wetcoat. When I get back, home I will get my stuff to offer up. Budget, This is extremely generous of you!!! Winter got quite long here as well; spent much of it compounding/polishing/coating some of our fleet vehicles...lotta personal time invested (as well as $$) but what I learned from doing it (using newly acquired Flex 3401, Rupes LHR15 & Mini) was invaluable. Nice thing was that some of the vehicles were so old, the finishing difference was quite dramatic. Also, was able to try some things that I`d be hesitant to try on a vehicle that `mattered`. Thanks to all, it`s been fun doing this. Have learned so very much from all I have come in contact with here, everyone has always been very cool to this newb. Happy waxing, sealing or coating, whatever may be your preference! Great Goodness! I can`t believe the generosity! How much did you spend in shipping all this stuff? Wasn`t too bad in overall scheme of things; boxes were kinda small. USPS Smart Post was best for items with dimensions under 12". Did kinda give me a more sympathetic view on vendor shipping...so there`s value to me in that. Still worth it...trying to collect shipping woulda been a hassle and my laziness often wins out over practicality. Likely also woulda made it harder to get rid of stuff...at no cost/no risk, figrd it would be easier to clear it all out. Besides, what good is free if it`s not really free?